While logic is the mathematical foundation of rational reasoning and the fundamental principle of computing, it is restricted to problems where information is both complete and certain. However, many real-world problems, from financial investments to email filtering, are incomplete or uncertain in nature. Probability theory and Bayesian computing together provide an alternative framework to deal with incomplete and uncertain data. Emphasizing probability as an alternative to Boolean logic, Bayesian Programming covers new methods to build probabilistic programs for real-world applications. 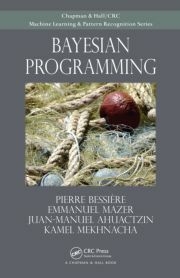 Written by the team who designed and implemented an efficient probabilistic inference engine to interpret Bayesian programs, the book offers many Python examples that are also available on a supplementary website together with an interpreter that allows readers to experiment with this new approach to programming. Only requiring a basic foundation in mathematics, the first two parts of the book present a new methodology for building subjective probabilistic models. The authors introduce the principles of Bayesian programming and discuss good practices for probabilistic modeling. Numerous simple examples highlight the application of Bayesian modeling in different fields. The third part synthesizes existing work on Bayesian inference algorithms since an efficient Bayesian inference engine is needed to automate the probabilistic calculus in Bayesian programs. Many bibliographic references are included for readers who would like more details on the formalism of Bayesian programming, the main probabilistic models, general purpose algorithms for Bayesian inference, and learning problems. Along with a glossary, the fourth part contains answers to frequently asked questions. The authors compare Bayesian programming and possibility theories, discuss the computational complexity of Bayesian inference, cover the irreducibility of incompleteness, and address the subjectivist versus objectivist epistemology of probability. A new modeling methodology, new inference algorithms, new programming languages, and new hardware are all needed to create a complete Bayesian computing framework. Focusing on the methodology and algorithms, this book describes the first steps toward reaching that goal. It encourages readers to explore emerging areas, such as bio-inspired computing, and develop new programming languages and hardware architectures.